Is Current Roster the Best Lakers Squad Ever? Rob August 20, 2010 R.S. De France No Comments on Is Current Roster the Best Lakers Squad Ever? Owner Jerry Buss’ recent comments about the Lakers are very smart, very measured, saying he feels ‘everytime’ they [the Los Angeles Lakers] go to camp, he feels like it could be the best Lakers team ever. From an owner’s standpoint, that has to be motivational. From a position outside of the Lakers organization, Buss suggesting that this [the 2011 team] “could be the best team we’ve ever had” sounds a little ridiculous. “Every time I’ve ever gone to camp, everybody starts talking and saying, ‘This team could be the best team we’ve ever had,’ and I guess I fall into that same trap because when I look at this team, every single individual on that team seems to me capable of playing a very important role next year and as of now, I feel there’s a good chance this could be the best team we’ve ever had” (“Buss Pleased with Lakers’ Moves”). I believe history will show that the late 2000’s Lakers is not the best Lakers team ever. A championship team, however, should only be compared to other championship teams, so we will not compare these Lakers to say the Eddie Jones and Nick Van Exel Lakers of the mid-90’s. That puts the late 2000’s Lakers team in the unenviable position of being compared historically to teams with players like Wilt Chamberlain, Jerry West, Elgin Baylor, Magic Johnson, Kareem Abdul-Jabbar, George Mikan, and Shaquille O’Neal. First, it should be noted that I love the Lakers, in general. I have supported Kobe Bryant throughout his career, even in the darkest days in Denver. I’m happy that he’s evolved into a more complete player and leader. This argument is no slight against Bryant, but more of a referendum on teams and teamwork. Okay, so why wouldn’t these Lakers compare well, historically? I know they’ve come along way from 2008, but these Lakers are still soft. They may be tough enough to win back-to-back titles during a recession (where some teams are handicapped by the economy or other factors), but that may not be good for this team, historically. Being just barely “tough enough” during an era not known for toughness, the late 2000’s Lakers would have had trouble dealing with teams like the Detroit Pistons of the 1980’s, the Knicks of the 1990’s, and even a healthy San Antonio Spurs team of the 2000’s. The NBA’s first dominant big man, George Mikan won 5 titles for the Minneapolis Lakers. A phenomenal scorer, Mikan did not do it alone either, as he was joined by forward Jim Pollard, “iron man” Vern Mikkelsen, playmaker Herm Schaefer, Slater Martin, Clyde Lovellette, and Pep Saul. Clearly, Mikan was the gritty force behind these 5 titles, but as time and the ’50’s wore on, Mikan had to rely more and more on his teammates, especially Pollard and Mikkelsen. As Mikan’s ability to score 30 ppg deteriorated and he became a 20 ppg scorer, the Minneapolis Lakers put forth good team effort and a more-balanced scoring attack. This team was so well balanced that even after the retirement of George Mikan, the rest of the Lakers’ squad and their young new leader Elgin Baylor still made a run to the 1959 NBA Finals. Elgin Baylor retired early into the 1972 season, a shock to the Lakers that spurred them onto winning 33 games in a row, an NBA record. Gail Goodrich, Jerry West and Wilt Chamberlain anchored this team. Although he was close to retiring (as Wilt would in ’73), Chamberlain was still incredible. Goodrich was young and West was fading, but these Lakers still had an unstoppable force. These Lakers won the title in 6 games against the New York Knicks, Chamberlain being named the Finals’ MVP. In a season where they set a new record winning 33 games in a row, the Lakers also set the NBA’s most wins in a season with 69 (later broken by Jordan, Pippen, and Rodman on the 72-win 1996 Chicago Bulls). Their records, though, stood for 24 years. This would prove to be Goodrich, West, Chamberlain’s only title as members of the Los Angeles Lakers. Although these Lakers already had the NBA’s MVP and most dominant scorer in Jabbar, they never won a title until the drafting of Ervin “Magic” Johnson. The core of Magic and Jabbar would combine for 5 championships during the decade, including 8 trips to the NBA Finals. This was probably one of the deepest and most unstoppable teams in NBA history because of the additions of players like James Worthy (’88 Final’s MVP), Bryon Scott, Bob McAdoo (’75 MVP), A.C. Green, Mychal Thompson, Kurt Rambis, Michael Cooper, Norm Nixon, and Jamal Wilkes. The clutch and triple-double performances by Worthy (ala Walt Frazier in 1970) and the defense of Cooper became legendary. Similar to the ’72 and 00’s teams, the Showtime Lakers were led by several Hall of Fame players. Johnson and Jabbar were an overwhelming combination, accumulating 6 MVP’s between them with the Lakers (3 each). Magic should always be remembered, not only as the most charismatic, but also as the engine that made this team work, averaging nearly a triple-double in more than a single playoff run. The legendary Jabbar went from completely dominant to moderately effective in his last six seasons with the Lakers as he progressed in years. Nonetheless, he was a major part of each championship run, like in ’87 when he led the Lakers’ charge with 32 points in a game 6 series-clinching victory over the Boston Celtics. Another factor that made this team so dangerous was their ability not only to rely on Magic and Jabbar, but the team’s ability to allow the offense to run through other players, like Nixon, Worthy, Wilkes, and Scott. What happens when you combine the most dominant center since Wilt with a young scoring guru that would evolve into the best player of his generation? Sprinkle in the wisdom of the Zen master Phil Jackson and this became a recipe for success, resulting in a 3-peat and 4 trips to the Finals in 5 seasons. This was a fascinating team to watch because of their brilliance and also because of their volatility. Unlike the Showtime Lakers, who had the Captain Jabbar who was almost immediately overshadowed by his young running mate Magic Johnson (Finals’ MVP in his first season), the early 2000’s Lakers’ had a dominant big man in Shaq who refused to be overshadowed by his up-and-coming running mate Kobe Bryant. Famous for lines like, “this is my f*****g team,” “if the big dog don’t eat, then the paint won’t get guarded. Period;” Shaq refused to share the leadership of the team like a true ambassador of the game (like Kareem). Similar to the great Lakers’ teams during the Showtime era, the early 2000’s Lakers’ had a very well balanced team. In addition to Hall of Fame players Gary Payton and Karl Malone, who played for the Lakers in the ’04 season (resulting in a trip to the NBA Finals), Bryant and O’Neal had a helpful cast. During this run, their teammates included Derek Fisher, Robert Horry, Brian Shaw, Rick Fox, Ron Harper, and Glen Rice. Fisher played a key role in running the point. Horry delivered almost as many clutch buckets as Bryant and O’Neal. Fox played the role of defensive stopper. O’Neal and Bryant not only led the team in scoring, but in most major categories—Shaq (rebounds, blocks, scoring, and field goal percentage) and Bryant (assists, 2nd in scoring and steals). Despite having two first ballot Hall of Famer’s who could not seem to agree on the nature of the Lakers’ offense, this team was one of the most dominant ever. Their ownership of the league included a 67-win season and a 15-1 run in the NBA playoffs (best ever). These Lakers, now led by Kobe Bryant and Derek Fisher, have won two consecutive NBA titles (in 3 trips to the Finals), with a chance for another title in ’11. Artest (’10), Fisher, Odom, Ariza (’09) and Bynum averaged around 10ppg during these playoffs runs, which is nice, but its not like any of them are putting up a triple-double in a game 7 (ala James Worthy). And that’s the point. While these current Lakers may look like an all-star team compared to other teams in 2010-2011; they are not nearly as balanced or as deep as some of the legendary Lakers teams to have come before them. With a combination of Bryant, Fisher, Pau Gasol, Ron Artest, Lamar Odom, and Andrew Bynum (shouldn’t forget about Trevor Ariza either), these Lakers are a talented bunch. This team won 65 games in ’09, but only 57 in ’10. As a Lakers’ fan, I have to love that Bryant, Fisher, and coach Phil Jackson have managed to assemble yet another team capable of a 3-peat. But, I’m not naïve, either. I know if you put any of the Shaq-Kobe Lakers teams against this current roster of Kobe Bryant and others, the Shaq-Kobe Lakers would dominate. Shaq would break Gasol’s skull like a ripe melon during one of his thunderous dunks (lo siento, Pau). The 2008-present Lakers have made 0 major records that will last 24 years. These Lakers have been somewhat dominant in mostly avoiding losing more than 2 games in a row (thanks to Gasol). While I’m obviously thrilled that the Lakers have a chance for a third title in 3 years, I’m not so sure about Buss calling the late 2000’s Lakers the best Lakers’ team ever assembled. That is paramount to blasphemy in my book. I would give the late 2000’s Lakers a slight edge over the Lakers of the 1950’s. I have a feeling Kobe Bryant would have been asking George Mikan “how his **** tastes.” But, that’s it. 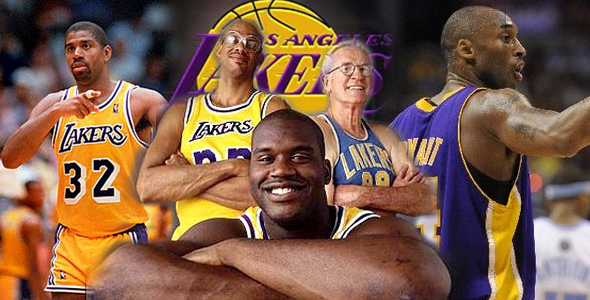 The 1972 team, the Showtime Lakers, and the early 2000’s Lakers were all superior to this current roster. Even NBA.com would agree with me as they already rank the ’72 and ’87 Lakers’ squads as 2 of the 10 best teams ever assembled in the NBA. So, all respect to Kobe, Buss, Jackson and the current lineup of NBA Champion Lakers, they are not the best Lakers’ team of all time, nor are they close. But, this statement by Buss could be a nice motivator for the seasoned scoring machine known as Kobe Bryant. R.S. De France is a College and University instructor of English Composition. He has a B.A. in English and an M.A. in Rhetoric, Composition, and Writing. One of his life-long pursuits has been writing and covering anything related to sports, specifically the NBA. Recently, De France, his wife, and another colleague started an internationally read magazine at Shwibly.com.